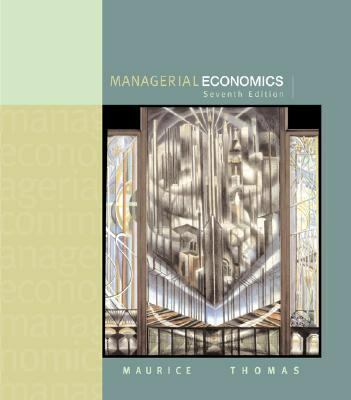 by Maurice, S. Charles, Thomas, Christopher R.
Maurice, S. Charles, Thomas, Christopher R.
Maurice Thomas' Managerial Economics teaches students how to use microeconomic theory to analyze business decisions. In a clear and engaging writing style, the 7th edition explores the current market forces that create both opportunities and constraints for business enterprises. The book has enjoyed success in part because of its mid-level rigor. This edition also features a stronger emphasis on international perspectives and updated examples from today's high-tech economy. Strategic decision making in oligopoly markets has been modernized.Maurice, S. Charles is the author of 'Managerial Economics', published 2001 under ISBN 9780072392913 and ISBN 0072392916.